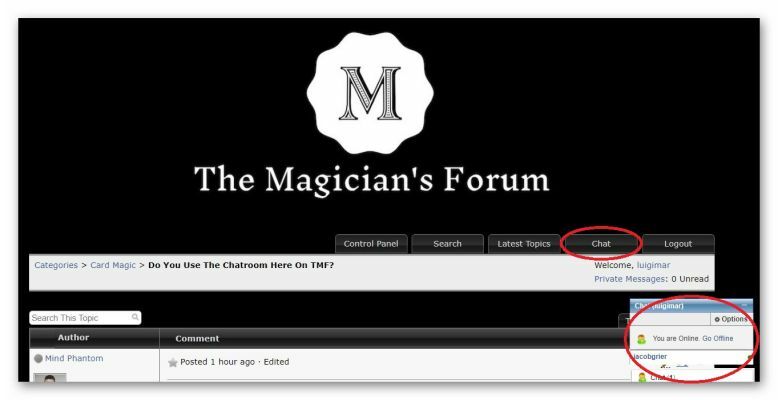 Categories > Card Magic > Do You Use The Chatroom Here On TMF? I must admit that I don't really use the chatroom here on the forum, even under my old screen name Logan Five. I don't know why that is...what am I missing out on? I've chatted maybe 10 times since I've been here. Are there others who feel like me. You mean the private message thing? It's the blue thing on the lower right corner of the site that says "Chat". The way I see it, there are actually 2 different (live) chats here. The "blue thing" you mentioned on the lower right corner and the other one is a tab on the top part of any page on the forum (below the forum name). Both are highlighted below. In the blue thingie you can click on any person's name who has a green dot next to his/her name and they will receive the message you type when you press enter. If somehow they do not receive the message (e.g. they log out before they receive the message or they mark themselves as being offline), the message gets lost. The other chat tab started working properly about 2 months ago when Rudy asked the people in charge of maintaining the forum to work their magic and I used it with Rudy that same day. Some other people joined the chat and I haven't used it again. I've been there several times but nobody is there so I am alone talking to myself and I just leave the room. And if we count the forum itself, it is another chat. But in here you do not have to be present to talk to other members, unlike the other 2 chats. Do you get signed in to the blue chatroom when you log into the site? Or, how does one get logged into the blue chatroom? I was one of those who jumped on to help rudy to see if that chat worked. I enjoy it but since that first time I've never seen anyone on it. I don't use it. No reason beyond the fact that I don't use Chatrooms at all. This is the nearest I get. Like other folks quoted above, I also don't - and never will - use chatrooms. Rudy sent my password for the "inner circle" via the chatroom. I was browsing the forum and received a notification that he was chatting with me. Since then, I have not used it. It seems to be interesting when you are discussing on a thread and the two or three involved people are connected simultaneously. Unfortunately, this seldom happens in my case, since I am in Europe, 6-9 hours more than in America.